The music of Frankie Valli and the 4 Seasons – not just for babys and toddlers, but for parents and grandparents, too! Available on Amazon and at Best Buy, J & R, Barnes & Noble and FYE. “Jersey Babys” is the result of the hard work and dedication of Danielle Gaudio-Lalehzar, daughter of Bob Gaudio, an original member of the Four Seasons and a member of the Rock and Roll Hall of Fame. It is an inventive instrumental reinterpretation of the Four Seasons’ major hits geared toward a new audience – children. 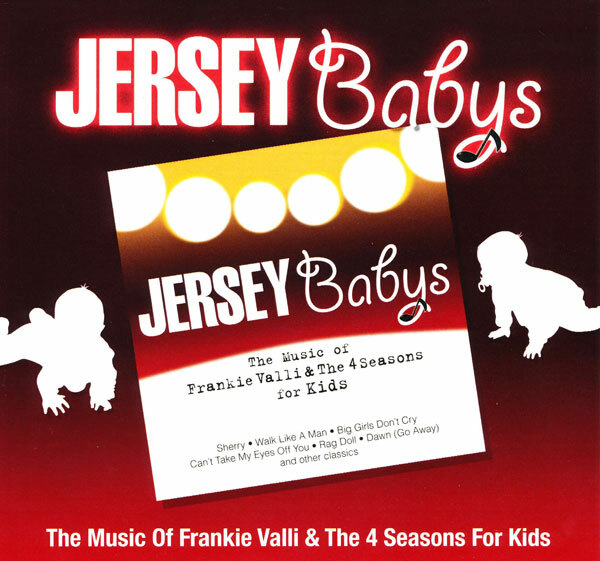 The 13 tracks on the “Jersey Babys” CD, which were all originally written by Bob Gaudio, are soothing, gentle adaptations of Four Seasons hits — minus the lyrics. In the words of Gaudio — who agreed to the project after much cajoling and coaxing from Danielle — working on the album was like “trying to create a musical playground” in which the tunes were boiled down to their most basic elements, “naked if you will,” and then dressed again in new clothes. First simplified into their essential melodies, the songs were then re-imagined using violins, flutes, pianos and mellow electric beats – in the process becoming both something new and yet remaining comfortingly recognizable to the accustomed ear. Each song is uniquely crafted. “December, 1963 (Oh, What a Night)” is sweetly jaunty; “Can’t Take My Eyes Off Of You” becomes the love song of a parent to a child; and “Ronnie” is rendered into a tranquil lullaby. “My father had to strip the songs and start from scratch to create new arrangements,” said Danielle, who grew up in the Bergenfield/New Milford area and in Mullica Hill. “So in the end, they’re very familiar, but also like completely different songs – like a brand new way to appreciate the music in its raw form,” said Danielle, who now lives with her family in Garden City, Long Island. “Though the lyrics are great and add another level of meaning, the music is also able to speak without them, which really shows their power,” she said. The idea for “Jersey Babys” came to Danielle about eight years ago after hearing a “Beatles for Babies” album at a friend’s house when her older son was just a toddler. “I liked what I heard so much I ran out and bought it for myself and for all of my friends who were having babies,” said Danielle, who has a degree in elementary education. “There are a number of variations and versions of the ‘Beatles for Babies’ albums,” she said, “and I actually ended up buying the whole series.”“Then I went out and bought Elvis for Babies, which was equally as good,” she said. “And it made me start to think of dad’s music, and how much I would love to have something like the Beatles album with his music for my kids.” What resulted ultimately became a family affair. But, from the time the concept first began to germinate in Danielle’s mind to the moment the album was completed, she had quite a lot of work and a great deal of convincing to do in order to bring it to fruition. “It was about five years before the thought turned into something real,” she said. “I mentioned my idea to my father, but it didn’t go anywhere for a while.” Though negotiations with potential labels dragged on for another year and one-half — with the usual amount of enervating corporate hemming and hawing — Danielle clung to her vision, and when “Jersey Boys” became a bona fide hit in 2005, she was able to get her father more excited about her idea, and the project really started to take off. Robby Robinson, Frankie Valli’s longtime musical director and keyboard player, agreed to co-produce; and Gaudio himself put up the money to bankroll the venture. Danielle’s brother, Shannon, a graphic designer by trade, handled the art direction and designed the CD cover. Because Robinson was on tour with Valli at the time, he would periodically send clips via e-mail of what he was working on to Danielle for her to critique. “At the beginning, it wasn’t right,” said Danielle, who has known Robinson since she was a little girl. “It sounded a little like elevator music,” she said, “so I wrote back to say I wanted it to sound a little more like music from a music box.” “I made him get the Beatles CD, and I made my father listen to it again,” she said. “By that time, I’d probably listened to it thousands of times. But I never get tired of it.” It took about a year to complete, but when it was finished Danielle said “Jersey Babys” was exactly what she had had in mind. “I didn’t just want to like it, I wanted to love it and I did,” said Danielle. “I was so pleased with the music, and I was also happy my father was mixing it because he’s usually so busy with the play, but he’d taken the time out, and I knew he’d really done it for me.” “He put a lot of work into mixing the tracks and tweaking them so they were just right because he’s a perfectionist, and that truly shows in his music,” she said. In recent years, the Four Seasons’ fan base has been broadening in an ever-widening arc with the success of “Jersey Boys” on Broadway. In addition to loyal fans, the group’s following has grown exponentially, especially among younger listeners, many of who weren’t even born when the original songs were released. The music’s intergenerational appeal can provide a common ground between parents and their children. Many young people don’t realize how much the Four Seasons have influenced contemporary pop culture – through Heath Ledger’s famous serenade in “10 Things I Hate About You,” the “Dirty Dancing” soundtrack and numerous covers and remixes of the original tracks. A Norwegian hip-hop group, MadCon, recently went to Number One in Norway with a cover of “Beggin,” which was first released by the Seasons in 1967. And students at Franklin School in Bergenfield, for example, are doing just that. When Danielle, who attended Franklin School in the second grade, happened to meet Principal Rosemary LaGamma at Bob Gaudio’s honorary graduation ceremony from Bergenfield High School at the beginning of February – Gaudio had left BHS in 1958 to pursue his music career – she gave her a copy of “Jersey Babys.” LaGamma then passed the album on to Franklin School first-grade teacher Marie Sokolowski, who uses music in her classroom on a daily basis. She played the CD for her students; they loved it immediately. Danielle said she also believes strongly in the importance of exposing children to music at an early age. There are currently 18 comments. Not just for babies. We listen to the CD in the car every morning. My wife’s colleagues can’t get enough at work. This is such a multi-talented family, is there anything they do that doesn’t turn to GOLD! Thank you, once again for the great music. My grandchildren will wear this CD out in 12 seconds. The Four Seasons Meet Baby Einstein. Jersey Babys is a wondrous CD, full of dream-like, heavenly soundscapes. It proves that the music of the Four Seasons were built on sturdy melodies and chords which shine, even without the wonderful production and vocal arrangements on the original records. As befits a Gaudio family project, all the songs are by Bob Gaudio. This music may actually be better appreciated by adults than by babies, because the arrangements are very inventive, keeping the mind actively engaged in the listening experience. And yet the music soothes frayed nerves at the same time. I love it ! I think all ages will go for this . Frankie always wanted as many instruments as he could put into a song, well he has it now. I’m ordering mine now. This is an amazing CD. My children are in grade school and absolutely love it! I would highly recommend this as a baby gift! It is soothing, relaxing and fun music – great idea! We love it! What better way than this to turn my young grandson onto the music of the Four Seasons. Gotta have someone to whom to leave my collection, just might be him. Who would have known that one of those little kids playing in the yard in the background of Saturday’s Father (“Let’s play hide and seek!”) would go on to such success? It’s a great time to be a 4 Seasons fan, although many of us old-timers have known all along the genius of your dad, Bob. Thanks to you and your family for giving us this wonderful music. I’ve had the pleasure to listen to this CD…already too many times to count (!) and trust me, the beautiful music here isn’t just for kids. An endeavor like this needs an accompanying interview of this nature, because a father/daughter/son can’t team up without intriguing folks. I loved reading in the interview about Danielle’s resolve to make this happen, evidenced when she contacted the company who did a children’s CD of Beatles music. (Okay, so the company wasn’t biting, but I have to say…you go girl!!) With this brand of tenacity, Danielle will CREATE clear sailing ahead. Certainly not an easy thing in any business. The CD & case design by Shannon Gaudio incorporates everything- cleverly implanting fond emotions… the block lettering of JERSEY for Jersey Boys’ fans, the whimsical design of ‘Babys’ with the endearing note cradled in the ‘y’ (no bullsh** letter, as Mary Delgado might say) and the nostalgic lettering used in “Frankie Valli and the 4 Seasons for Kids”. Even the sentiments in the liner notes convey a warm, family ambiance including a charming childhood photo of Danielle & Shannon. Danielle used the word ‘perfection’ in the interview when describing the final musical content; but fortunately, perfection describes this project from beginning to end! Speaking of content, there are finger-snapping moments, as well as sounds that had me picturing figure skaters performing SO gracefully- as if in a dream. Dawn, Ronnie, CTMEOY and Silence is Golden are soothing and hypnotic- perfect for wound-up, little ones at naptime (or wound-up, big ones on the way home after a tough day at work. Thank you Danielle, “Dad”, Robby, Shannon & others for bringing this infectious and unique instrumental CD to fruition! I was given this CD by a nice co-worker of mine so that I could play it for my daughter. Turns out she loves it and so do I!!! We play it in the car all the time! Thanks for putting out such a great CD – look foward to more!!! Great CD !! Can’t wait for part 2. I have a greater appreciation for the music of the 4 Seasons. I wish Frankie Valli would redo some of the hits using these arrangements. How wonderful to hear these songs as lullabyes. Your Dad wrote the most incredible songs which is evident in the success of Jersey Boys. What a fabulous idea! All of these babies will grow up listening to the songs that were part of our generation. BRAVO! I had the opportunity to work with your dad as part of a backup singer on a few of his songs….”You’re Ready Now”, :Cry for Me” , and “The Proud One.” I know how proud he must be of you. The apple doesn’t fall far from the tree…..
OH MY GOD IS THIS DARLING !!!! WHAT A GREAT IDEA, IM SO TIRED OF THE CD IN MY BABY’S ROOM, MY 8 YEAR OLD JOSH IS ALREADY ADDICTED TO THEM. NOW IT’S MY ONE YEAR OLDS TURN..THANK -YOU..WE LOVE THE JERSEY BOYS…. Great C.D. I love the music, very soothing for the children. I remember your dad years ago. I met him with all THE Four Seasons. Best wishes to Bob and your children. Its very exciting that you put this album together and gave us all another wonderful way to listen to our favorite group in a beautiful lullaby dream! !Congrats on your hard work. Danielle, thanks for the links to the interviews. I don’t have XM radio, so this was a real treat. And I echo Dale, that my work colleagues love it too. Please let us know when it enters the Billboard charts.